With Rob Cowan. Including My Favourite Duos; Musical challenge; Music in Time: Schoenberg: A Survivor from Warsaw; Castelnuovo-Tedesco: Overture (The Taming of the Shrew). My Favourite... Duos. Rob shares his favourite examples of these works for two musicians, where each artist's response to the other is put under the spotlight, creating what is perhaps the ultimate expression of chamber music. Rob's choices explore a selection of instrumental combinations including duos for strings by Bartók, a duo for pianos by Schubert, and duos for percussion, and guitars. 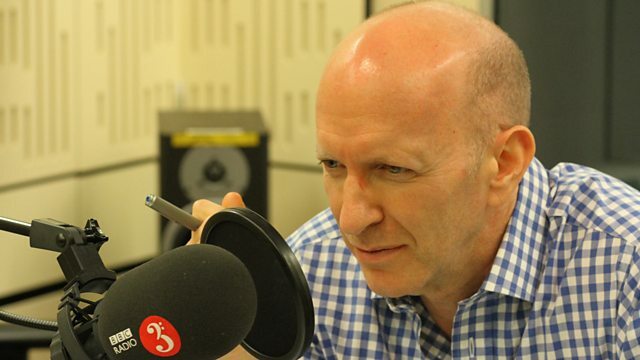 Rob's guest, historian, writer and television presenter Simon Sebag Montefiore, will be sharing a selection of his favourite classical music, including works by Shostakovich, Prokofiev and Tchaikovsky that link to his writing on Russia, every day at 10am. Simon's acclaimed history books have been published in over 45 languages and include Jerusalem: The Biography, Catherine the Great and Potemkin and Young Stalin. His latest book, The Romanovs 1613-1918, chronicles the stories of twenty tsars and tsarinas, and is already a bestseller in the UK, Australia and the USA. Simon has also won literary prizes for his fiction work. He has written the first two instalments of a trilogy of thriller-love-stories set in Russia. The second in the series, 'One Night in Winter', won the Best Political Novel of the Year Prize and was longlisted for the Orwell Prize. Rob places Music in Time. The focus is on the Modern period and the first significant musical outpouring reflecting the horrors of the Holocaust: Schoenberg's A Survivor from Warsaw. Rob takes inspiration from tonight's Prom which features Shakespeare-themed music by composers on both sides of the pond including Finzi, Sullivan, Bernstein and Cole Porter. This morning Rob broadcasts one of the eleven overtures that the Italian composer Mario Castelnuovo-Tedesco wrote for the Bard's plays, before emigrating to the USA in the late 1930s to escape persecution in Mussolini's fascist state. Performer: Eudice Shapiro. Performer: Ralph Berkowitz. Orchestra: Gewandhaus Orchestra Leipzig. Conductor: Kurt Masur. Performer: Sérgio Assad. Performer: Odair Assad. Singer: Lisa Milne. Singer: Ruxandra Donose. Singer: Andrew Kennedy. Singer: Christopher Maltman. Orchestra: London Philharmonic Orchestra. Choir: London Philharmonic Choir. Conductor: Vladimir Jurowski. Orchestra: Hallé. Conductor: Adrian Boult. Performer: Piers Adams. Performer: David Wright. Orchestra: Gothenburg Symphony Orchestra. Choir: Göteborgs Symfoniska Kör. Ensemble: Gothenburg Symphony Brass Band. Ensemble: Gothenburg Artillery Division. Ensemble: Churchbells of Gothenburg. Conductor: Neeme Järvi. Narrator: Gottfried Hornik. Choir: Male Choir of the Concert Chorus of Vienna State Opera. Orchestra: Vienna Philharmonic. Conductor: Claudio Abbado. Orchestra: West Australian Symphony Orchestra. Conductor: Andrew Penny.